Background: Autosomal dominant polycystic kidney disease (ADPKD) is the leading inheritable cause of end-stage renal disease (ESRD) and one of the leading causes of ESRD overall. ADPKD patients differ from the overall dialysis population; however, there is little published data regarding health care costs for ADPKD patients on dialysis. Methods: This retrospective observational cohort study was designed to quantify health care utilization and costs for ADPKD patients with ESRD who received initial services at a single large dialysis organization between January 1, 2007 and December 31, 2009. Parallel results and baseline patient characteristics for control patients with ESRD etiologies other than ADPKD were performed for reference. Dialysis-related utilization and health care costs for patients with ADPKD in ESRD overall and during time horizons that correspond to Medicare-eligibility benchmarks were analyzed. Baseline patient characteristics were described for all patients and included demographics, comorbid illnesses, and clinical characteristics. Dialysis-related utilization, hospitalization rates, and health care costs were considered longitudinally. Results: Total health care costs for ADPKD patients were high at US$51,048 per patient-year based on the overall analysis. Total health care costs were lower for ADPKD patients than for control patients on dialysis. Patients with ADPKD were generally younger, had a lower Charlson Comorbidity Index, and had lower rates of comorbid conditions, which may have contributed to the lower overall costs seen for patients with ADPKD. Conclusion: Health care resource utilization and costs for patients with ADPKD in ESRD requiring dialysis were high, and therapeutic interventions that can prevent or delay the progression to ESRD may increase dialysis-free life for patients with ADPKD. Autosomal dominant polycystic kidney disease (ADPKD) is the most common genetic kidney disease.1–3 The prevalence of ADPKD was estimated to be approximately 1:400 to 1:1,000 in a 1983 landmark single-site US study.4 ADPKD is the leading inheritable cause of end-stage renal disease (ESRD), as well as one of the leading causes of ESRD overall.2,5 Additionally, a larger proportion of patients with ADPKD progress to ESRD compared with those with other forms of chronic kidney disease (CKD).6–8 Patients with ESRD have significant burdens of coexisting illnesses, conditions, and symptoms.9,10 Some patients, in particular those with CKD who typically have considerable comorbidities, choose to undergo conservative (non-dialysis) treatment.9,10 However, dialysis remains a life-prolonging treatment for patients with ESRD. Despite the fact that ADPKD patients differ from the overall dialysis population in terms of age and prevalence of certain comorbidities, there are little published data regarding health care costs for ADPKD patients on dialysis. One study on the economic burden of ADPKD demonstrated an association between declining kidney function and increased health care costs, but did not investigate the specific costs involved in ESRD, including dialysis.13 Information about dialysis-related costs and the time course over which these costs are incurred are important factors that define the economic value of preventive therapy for ADPKD to insurers. Specifically, data on the time course over which ESRD-related costs are incurred, as they correspond to Medicare-eligibility benchmarks, help define the value of preventive therapy to the insurers who would assume these costs. Insurance coverage for ESRD is complicated, especially with regard to Medicare eligibility. For most patients with pre-existing commercial insurance, the insurance typically provides coverage for the first 3 months of ESRD treatment, after which they enter a ‘coordination of benefits period’ when the commercial insurer serves as the primary payer and Medicare as the secondary payer.14 By the start of the 30th month of treatment, nearly all patients transition to Medicare coverage for all dialysis services. In this study, dialysis-related utilization and health care costs for patients with ADPKD in ESRD overall and during time horizons that correspond to Medicare-eligibility benchmarks were analyzed. As a point of reference, results and baseline patient characteristics for control patients with other ESRD etiologies were analyzed in parallel. This retrospective observational cohort study included ESRD patients who received their initial outpatient services at a single large dialysis organization (LDO) between January 1, 2007 and December 31, 2009 within 30 days of first dialysis treatment. The beginning of the observation window, January 1, 2007, coincides with the time when the LDO’s electronic medical record (EMR) system was consolidated, and December 31, 2009 was chosen to allow at least 1 year of claims between study start and end (December 31, 2010). The 30-day period allowed the consideration of patients who transferred to the LDO after beginning dialysis in the hospital or hospital-based facilities. The LDO’s data on ESRD etiology is harmonized with Centers for Medicare and Medicaid Services (CMS) Medical Evidence Form 2728 and includes three categories of cystic renal disease: polycystic kidney disease, autosomal dominant (International Classification of Diseases, Ninth Revision, Clinical Modification [ICD-9-CM]: 753.13); polycystic kidney disease, autosomal recessive (ICD-9-CM: 753.14); and medullary cystic disease (ICD-9-CM: 753.16). The ADPKD group for this study consisted of patients with ESRD ascribed to 753.13; groups 753.14 and 753.16 were excluded from both the ADPKD group and the control group. Controls were randomly sampled from patients with ESRD etiologies other than ADPKD at a 3:1 ratio to ADPKD patients. In order to elucidate differences between these patient groups, control patients were not matched to ADPKD patients. Baseline patient characteristics, including demographics, comorbid illnesses, Charlson Comorbidity Index,15 and clinical characteristics, were abstracted from the LDO’s Clinical Data Warehouse (CDW). Likewise, dialysis-related utilization data were abstracted from the LDO’s CDW. Hospitalization data were abstracted from patients’ EMRs, and health care cost data were taken from Medicare Claims data from the US Renal Data System standard analytical files. Part A costs were considered for patient-months in which the corresponding patient had Medicare Part A primary insurance (Medicare primary, Part A and Part B [MPAB], or Medicare primary, other [MPO]), and these costs were taken from the Institutional Claims Standard Analytical File and paid costs. Part B costs were considered for patient-months in which the corresponding patient was enrolled in MPAB, and the corresponding costs were taken from the Physician/Supplier File and paid costs. Part D prescription drug costs were considered for patient-months in which the corresponding patient was enrolled in Medicare Part D. Paid amounts are not available, so total prescription drug costs were used representing the cost to the insurer and out-of-pocket costs to the patient. Cost data were only available among patients with Medicare as a primary payer, and therefore, in order to contextualize these costs and determine their potential for generalization to patients with other insurance types, comparisons were made between ADPKD and control patients for the demographic data, dialysis-related utilization, and hospitalization rates stratified by primary insurance type defined as ‘Medicare’ or ‘Other’. The primary purpose of this study was to quantify health care utilization and health care costs for ADPKD patients with ESRD, using controls to provide a point of reference. Given this, and the known systematic differences between ADKPD and other ESRD patients, formal statistical comparisons between groups were not made. Baseline patient characteristics were described for all ADPKD patients and all selected controls. Continuous variables were described by means, standard deviation (SD), medians, interquartile ranges (IQR), and minima and maxima ranges (range). Categorical variables are described as frequencies and proportions. Dialysis-related utilization, hospitalization rates, and costs were considered longitudinally. Relative to the start of dialysis, each was considered for the time frames of months 0–2, months 3–29, months 30+, and overall (dialysis months 0+). These time periods roughly correspond with Medicare-eligibility benchmarks. Dialysis-related utilization and hospitalization rates were considered for all ADPKD patients and all selected controls. Costs were considered only for Medicare patients (as described under ‘Study data’). The number of dialysis treatments per month was calculated for each patient in each month, and mean data were aggregated for the four time intervals. Data were summarized for patients with ADPKD and controls both across patient mean/SD and across patient median/IQR. Hospitalization rates (95% Poisson confidence intervals) were calculated by dividing the total number of hospital admissions by cumulative patient-time at risk and expressed as per 100 patient-months at risk for the analytic cohort contrasting ADPKD patients and controls. All costs were reported for the four time intervals based on payer perspective and were converted to fixed-year dollars using the Medical Care Services Consumer Price Index for inflation adjustment, 2010 base year.16 The number of months for which the patient had the coverage was identified for each cost (Part A, Part B, or Part D) in each time period and the total costs were summed up. The costs were divided by the identified number of months to get that patient’s per-person per-month (PPPM) cost. Rates were summarized across patient mean/SD and across patient median/IQR. This study consisted of 1,274 patients with ADPKD and 3,822 patients in the control group from an overall analytic cohort of 79,927 patients with ESRD (Table 1). 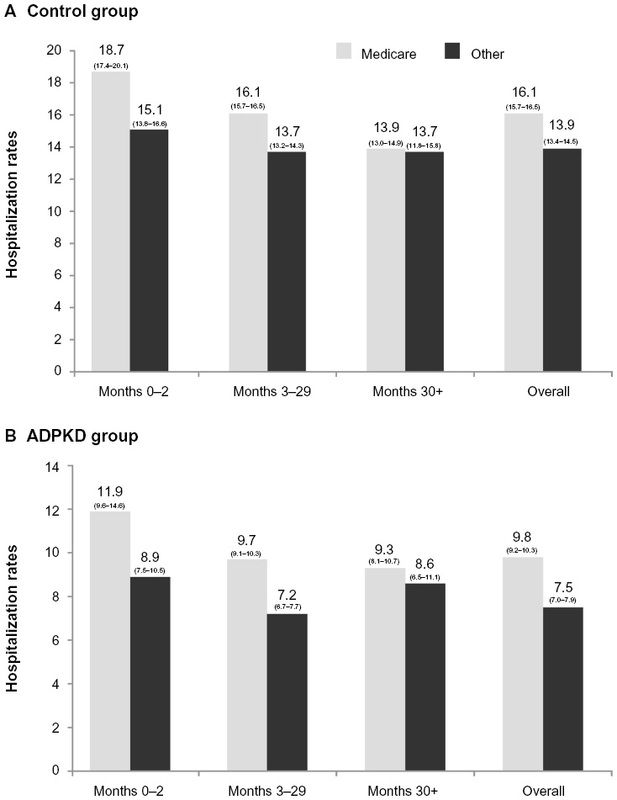 The median follow-up was 17.1 months for the control group and 20.7 months for the ADPKD group; follow-up varied among patients due to withdrawal from analysis, transfer of dialysis organization, transplant, etc. Compared with the control group, patients with ADPKD were younger (55.7 vs 62.8 years) and were more likely to be female and Caucasian (48.0% vs 43.0% and 70.7% vs 49.6%, respectively). Additionally, patients with ADPKD were less likely than control patients to have diabetes, heart failure, coronary disease, or cerebrovascular disease, and had a lower Charlson Comorbidity Index (3.5 vs 5.1, respectively). There was no difference in post-dialysis weight between the groups, but patients with ADPKD had a lower mean body mass index (BMI; 27.5 vs 28.5 kg/m2) compared with control patients. In terms of dialysis access, patients with ADPKD were less likely to have started dialysis using a central venous catheter (CVC) compared with control patients (52.3% vs 77.4%) and were more likely to have peritoneal dialysis as their first modality (12.2% vs 4.0%). Patients with ADPKD were also more likely to have a primary payer other than Medicare compared with control patients (67.0% vs 42.5%, respectively). Abbreviations: ADPKD, autosomal dominant polycystic kidney disease; IQR, interquartile range; SD, standard deviation. Patients with ADPKD underwent a mean of 13.6 treatments per month overall, or 10.7 treatments in months 0–2, 14.2 in months 2–29, and 14.1 in months 30+ (Table 2). Mean treatments per month for patients with ADPKD were higher in all time intervals compared with control patients. Patients with ADPKD had a mean overall rate of 8.6 hospital admissions per 100 patient-years, corresponding to a mean of 9.9 in months 0–2, 8.4 in months 3–29, and 9.2 in months 30+ (Table 2). Hospitalization rates were lower for patients with ADPKD compared with controls in all time intervals, and were the highest in months 0–2 for both groups. Abbreviations: ADPKD, autosomal dominant polycystic kidney disease; CI, confidence interval; IQR, interquartile range; IR, incidence rate; SD, standard deviation. Compared with the overall analysis, similar findings were observed when patients were stratified by primary payer (Medicare insurance vs other primary insurance). 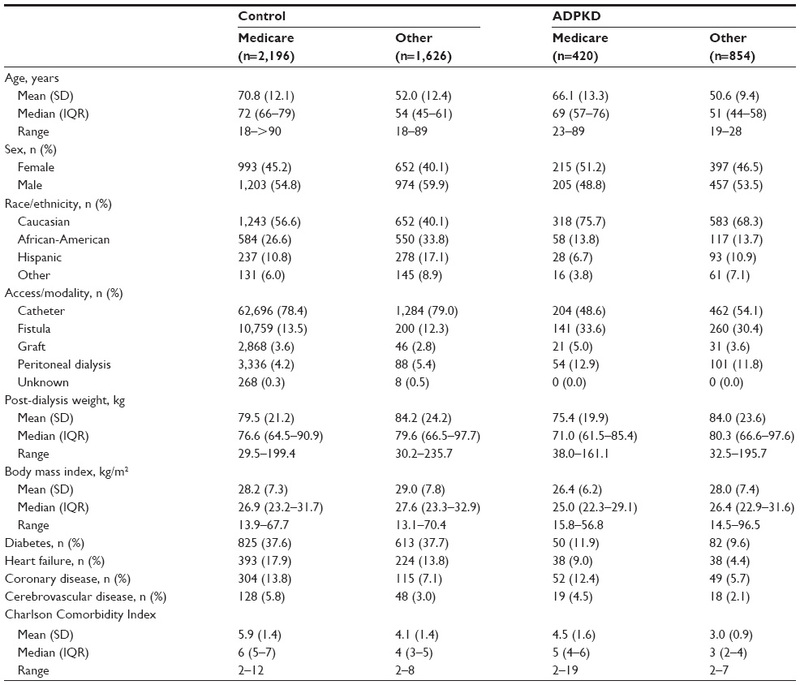 Specifically, demographic differences between patients with ADPKD and patients in the control group were similar to those seen in the overall analysis cohort (Table 3). Additionally, consistent with the overall analysis, mean dialysis treatments per month were higher at all time intervals for patients with ADPKD vs the control group, irrespective of primary payer source. Hospitalization comparisons were also similar to the overall analysis, although modestly lower rates were observed among patients with ADPKD with Medicare insurance compared with those with different primary insurance (Figure 1). 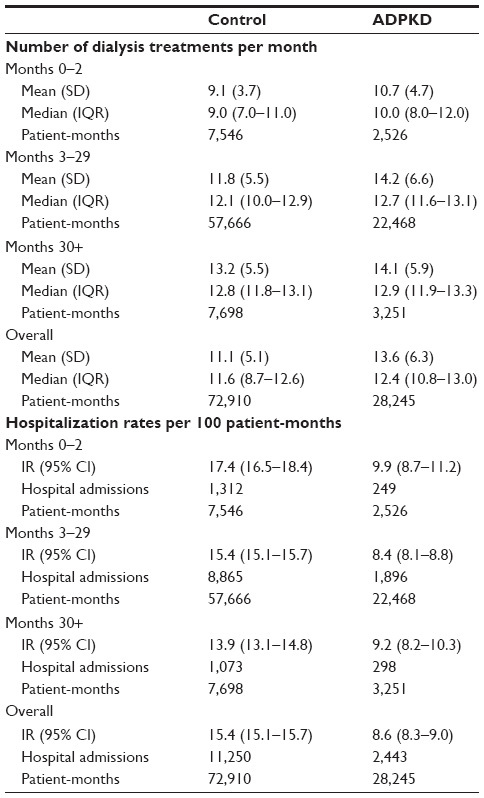 Figure 1 Hospitalization rates per 100 patient-months, stratified by primary payer. Note: Data presented as incidence rate with corresponding 95% confidence intervals. Abbreviation: ADPKD, autosomal dominant polycystic kidney disease. Total health care costs for ADPKD were high at US$4,254 PPPM (combining means of US$3,517 for Part A, US$472 for Part B, and US$265 for Part D costs), which translates to US$51,048 PPPY (US$4,254 PPPM ×12 months) based on the overall analysis (Table 4). Medicare Part A costs for patients with ADPKD were approximately US$3,517 PPPM overall or US$4,961 (0–2 months), US$3,088 (3–29 months), and US$4,595 (30+ months), and Medicare Part B costs for patients with ADPKD were US$472 PPPM overall or US$636 (0–2 months), US$429 (3–29 months), and US$987 (30+ months). Both total Part A and total Part B costs were lower for ADPKD patients compared with control patients for all month intervals. Medicare Part D prescription drug costs for patients with ADPKD were US$265 per treatment PPPM overall or US$325 (0–2 months), US$222 (3–29 months), and US$564 (30+ months). These costs were lower for ADPKD patients compared with control patients over months 0–2, 3–29, and overall, but not at 30+ months. Notes: aUS dollar amounts; banalysis included patients with at least one claim for Part B in each given time period; canalysis included patients with at least one claim for Part D in each given time period. Abbreviations: ADPKD, autosomal dominant polycystic kidney disease; CI, confidence interval; IQR, interquartile range; PPPM, per patient per month. The pattern of findings for demographic data, dialysis-related utilization, and hospitalization rates was similar between the overall analysis and stratification by payer type, indicating health care resource comparisons can be made using Medicare costs for the two cohorts. Total health care costs were lower for ADPKD patients than for control patients on dialysis. Demographic differences in the ADPKD vs control populations may have contributed to the lower overall costs seen for patients with ADPKD, as these patients were generally younger, had a lower Charlson Comorbidity Index, and had lower rates of comorbid conditions, including diabetes, heart failure, coronary disease, and cerebrovascular disease. 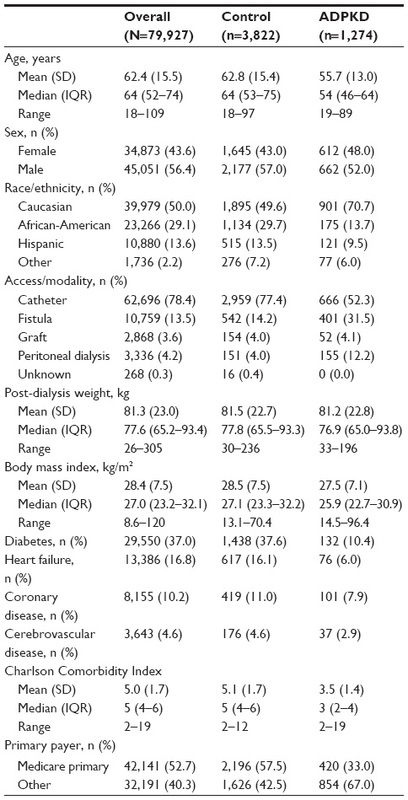 A greater proportion of patients with ADPKD started dialysis using an arteriovenous fistula for hemodialysis (31.5% vs 14.2%) or were on peritoneal dialysis as their first modality (12.2% vs 4.0%). Although costs for patients with ADPKD were high, the implication is that these differences resulted in lower costs compared with hemodialysis through a CVC, which was more common among non-ADPKD patients. It is possible that these lower-cost dialysis methods were used by patients with ADPKD because they often have a longer lead time to prepare for dialysis than patients with ESRD of other etiologies and because these patients have more experience observing dialysis due to the familial nature of the disease. The data presented here highlight dialysis-related costs for patients with ADPKD, as well as the time course over which these costs are incurred. There are several limitations with this study, including those inherent to any retrospective study. Specifically, ADPKD was defined through ICD-9-CM diagnosis codes from medical claims for services, therefore, errors in coding claims may have resulted in some patients with ADPKD being incorrectly identified as CKD controls or vice versa. Similarly, the accuracy of Medicare claims is not guaranteed, and therefore, general errors in coding claims may have affected the data. Additionally, costs are representative of only Medicare reimbursements and do not reflect commercial and other payer costs. This limitation was especially important in this study, as two-thirds of the ADPKD patients included in the study had insurance other than Medicare; however, the two patient cohorts were stratified and analyzed by payer type to address this concern. Finally, the LDO database is a unique source of information from a dialysis provider that captures the care that is provided directly to patients; however, the data set has the limitation that it cannot comprehensively capture hospitalizations (especially cause-specific hospitalizations) and oral medications. Estimates suggest that the LDO database has approximately 80%–85% specificity in capturing hospitalizations. Patients are scheduled for dialysis every 48–72 hours, and because most hospitalizations will result in a treatment absence, a hospitalization is discovered in this manner; additionally, database processes exist to capture hospitalizations not resulting from a treatment absence. This hospitalizations limitation does not apply to the Part A cost data included in Table 4, which were based on claims data. In the case of oral medications, information can be obtained through linkage to Medicare Part D or to the LDO’s in-house pharmacy, both of which can lead to selection bias. ADPKD is a leading cause of ESRD,2,5 with a large proportion of patients with ADPKD progressing to ESRD.6 Understanding the characteristics of ADPKD patients diagnosed with ESRD and investigating the costs associated with the disease is important for payer awareness. Health care resource utilization and costs for patients with ADPKD who progress to ESRD and require dialysis are high. Patients with ADPKD are generally younger and have fewer comorbidities; therefore, therapeutic interventions that can prevent or delay the progression to ESRD and the onset of dialysis may have the potential to increase dialysis-free life for patients with ADPKD, as well as reduce health care costs in this population. Editorial support for the preparation of this manuscript was provided by Scientific Connexions, Inc., funded by Otsuka America Pharmaceutical, Inc. This study was sponsored by Otsuka America Pharmaceutical, Inc., Princeton, NJ, USA. Sandro Rossetti is an employee of Otsuka America Pharmaceutical, Inc.; Christopher M Blanchette and Benjamin Gutierrez were employees of Otsuka Pharmaceutical during the study. Steven Brunelli and Ami Claxton are employees of DaVita Clinical Research, which has received funds from Otsuka America Pharmaceutical, Inc. in connection with conduction of this study. Debosree Roy has no conflicts to disclose. Steven Brunelli has received speaking honoraria from Fresenius Medical Care North America and has been a past member of Amgen and CB Fleet advisory boards and is a current member of Otsuka and Keryx advisory boards; his spouse is employed by AstraZeneca. The authors report no other conflicts of interest in this work. Chapman AB. Approaches to testing new treatments in autosomal dominant polycystic kidney disease: insights from the CRISP and HALT-PKD studies. Clin J Am Soc Nephrol. 2008;3(4):1197–1204. Hildebrant F. Genetic kidney diseases. Lancet. 2010;375(9722):1287–1295. Iglesias CG, Torres VE, Offord KP, Holley KE, Beard CM, Kurland LT. Epidemiology of adult polycystic kidney disease, Olmsted County, Minnesota: 1935–1980. Am J Kidney Dis. 1983;2(6):630–639. National Institutes of Health [webpage on the Internet]. Fact Sheet – Autosomal Dominant Polycystic Kidney Disease. Bethesda, MD: National Institutes of Health [updated March 29, 2013]. Available from: http://report.nih.gov/nihfactsheets/viewfactsheet.aspx?csid=29. Accessed November 5, 2013. Chapin HC, Caplan MJ. The cell biology of polycystic kidney disease. J Cell Biol. 2010;191(4):701–710. Zhang QL, Rothenbacher D. Prevalence of chronic kidney disease in population-based studies: systematic review. BMC Public Health. 2008;8:117. Gilbertson DT, Liu J, Xue JL, et al. Projecting the number of patients with end-stage renal disease in the United States to the year 2015. J Am Soc Nephrol. 2005;16(12):3736–3741. Davison R, Sheerin NS. Prognosis and management of chronic kidney disease (CKD) at the end of life. Postgrad Med J. 2013;90(1060):98–105. Murtagh FE, Sheerin NS, Addington-Hall J, Higginson IJ. Trajectories of illness in stage 5 chronic kidney disease: a longitudinal study of patient symptoms and concerns in the last year of life. Clin J Am Soc Nephrol. 2011;6(7):1580–1590. United States Renal Data System, 2013 Atlas of ESRD [document on the Internet]. National Institutes of Health, National Institute of Diabetes and Digestive and Kidney Diseases. Available from: http://www.usrds.org/atlas.aspx. Accessed March 2, 2014. Centers for Medicare and Medicaid Services. 2013 Annual Report of the Boards of Trustees of the Federal Hospital Insurance and Federal Supplementary Medical Insurance Trust Funds. Woodlawn, MD: Centers for Medicare and Medicaid Services; 2013. Available from: http://www.cms.gov/Research-Statistics-Data-and-Systems/Statistics-Trends-and-Reports/ReportsTrustFunds/Downloads/TR2013.pdf. Accessed March 2, 2014. Lentine KL, Xiao H, Machnicki G, Gheorghian A, Schnitzler MA. Renal function and healthcare costs in patients with polycystic kidney disease. Clin J Am Soc Nephrol. 2010;5(8):1471–1479. Centers for Medicare and Medical Services. Medicare Secondary Payer (MSP) Manual, 10.2 – End-Stage Renal Disease (ESRD). Woodlawn, MD: Centers for Medicare and Medical Services; 2005 [updated August 3, 2012]. Available from: https://www.cms.gov/Regulations-and-Guidance/Guidance/Manuals/downloads/msp105c01.pdf. Accessed May 16, 2014. Measuring Price Change for Medical Care in the CPI [webpage on the Internet]. Washington, DC: United States Department of Labor [updated April 12, 2010]. Available from: http://www.bls.gov/cpi/cpifact4.htm. Accessed May 28, 2014. CMS Fast Facts Overview [webpage on the Internet]. Centers for Medicare and Medicaid Services [updated Jul 2014]. Available from: http://www.cms.gov/Research-Statistics-Data-and-Systems/Statistics-Trends-and-Reports/CMS-Fast-Facts/index.html. Accessed May 19, 2014. United States Renal Data System, 2013 Atlas of CKD [document on the Internet]. National Institutes of Health, National Institute of Diabetes and Digestive and Kidney Diseases. Available from: http://www.usrds.org/atlas.aspx. Accessed July 8, 2014.